Get ready for an uber grid meltdown of gargantuan proportions on Wednesday peeps. In fact, I think Plurk and the entire blogosphere will explode too, and there’s a very exciting reason behind it. On Wednesday we finally get to see the long-awaited SLINK mesh body, and quite frankly I’m REALLY buzzing about the prospect! My Second Life, and I’m sure this applies to many others, has become infinitely better as a result of the amazing mesh hands and feet created by Siddean Munro. If you’ve been reading this blog for a long time you’ll know I’ve always had issues with my wrists in Second Life; I’ve always hated them and they’ve been a particular bug-bear of mine. They look so unpleasant in photographs, but the introduction of the Slink hands has made all the difference. No more do I despair at ugly, angry wrist bones jutting out at unfortunate angles when I’m posing for shots for the blog. The hands in fact are really beautiful wee things and have created a cottage industry for enthusiastic manicure and pedicure creators across the grid. Not only that, but the detailing on them, and the positioning of the fingers upon the hands has always really struck me as incredibly well thought out; whatever pose you choose they add a realism to your look that you just don’t get from the regular avatar. Of course, the fact that skin makers could release appliers for the hands and feet made them even more essential purchases, and consequently I think I have appliers now for the majority of the skins in my inventory. Depending on where you shop appliers can cost a small fortune, but they are so worth it. Wearing your exact skin tone across your entire frame courtesy of those magical appliers is such a simple, yet essential pleasure. In recent months we’ve seen tattoo layers become available for hands and feet too, again enhancing our individual looks even further. In fact, when you stand back and think about it the revenue generated by these add-ons must be outrageous! It’s made of win for everyone concerned; for SLink for providing the technology, in the first place, and for the and the skin makers, manicurists and pedicurists who have been canny enough to include appliers in their range. And don’t forget the shoe-makers and the jewellery creators and..and…GAH! The whole industry that has sprung up around these virtual appendages is absolutely immense, I don’t begrudge any of them single Linden either. The work that must have gone on behind the scenes to make all this achievable must have been terrific. And let’s not forget that there are now dedicated shopping areas where you can purchase every kind of add-on that your heart desires too. 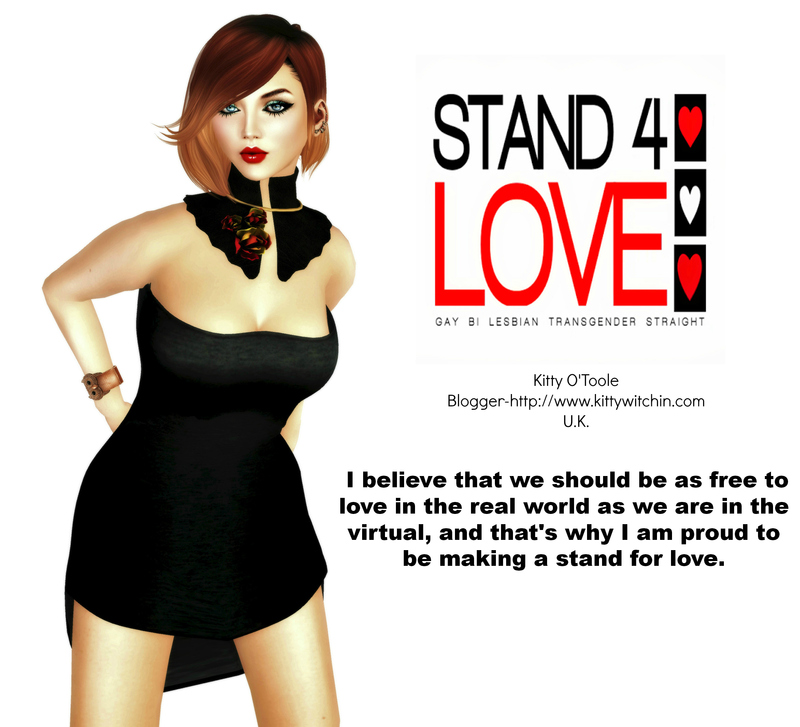 Seems to me so far it’s all been a roaring success, and when Wednesday comes I can see no reason at all for Siddean not to have applied her same high standards of creativity to the mesh body, or should that be bodies (ooh, the very thought!) that she’ll be releasing. Let’s face it her work has always been bob-on, and this is why I am so eager to see what she has been busily engaged upon for the past few months. I’m sure if you’re reading this then you are too. So what benefit will a mesh body bring? Truth be told, and don’t laugh, I don’t really know! As it stands I love the shape that I wear, so why will I want to change to anything else? I guess it’s curiosity that’s got the better of this Kitty. I want to see the way that the body blends in to the existing Slink Add-ons. I’m interested in the bewbs too, isn’t everyone? One of the reasons that I haven’t worn my Lola’s so much recently is because I just can’t size them to the scale that I want. I don’t necessarily want a huge, heaving bosom in Second Life, but I do want definition and shape beyond that which is already built in to the shape of the avatar. I’m hopeful that we’ll see some of that. Speaking of shape, I’m keen to see if curves will be catered for. I’m hopeful that they will, in fact they have to be a selling point. I want to see beautiful, shapely bums and hearty, wholesome thighs. I want to see clothes fit even better too and I admit I have no clue at all how the existing mesh marvels that I have in my wardrobe will fit, but I’m confident that this will be something that has been addressed. Also, how will they be sold? Will we get torsos to which you add whichever feet and hand style that you like, or will there be all-in-one versions too? There are huge benefits to both. Most importantly though we need the skin makers to get behind this release and create appliers that will work across the entire body. Think of the possibilities for tattoos and decoration and relish the prospect of seeing some truly innovative and stylish avatars on the grid in the coming months. Wednesday can’t come soon enough for me, and I’m sure that Siddean won’t let us down. As soon as I get my hands on anything resembling one of her releases, I’ll let you know what I think! GAH, I can’t wait! Picture above from Siddean’s blog, SLinkstyle. OMFG HOW AWESOME IS THIS?! Are you excited about the new mesh bodies that are starting to appear on the grid? What are your thoughts on this new mesh venture; do you think you’ll invest in one, or more? Let us know in the comments below!